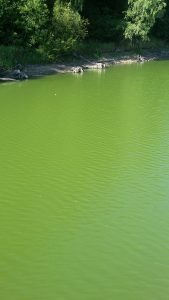 Almost everyone certainly met with the Cyanobacteria outbreak in ponds and natural pools; however, in recent years it is nothing unusual in water reservoirs used as drinking water sources as well, which causes a plenty of difficulties to water treatment plants. The problem is usually not the cyanobacteria themselves but rather the substances they produce (be it either metabolic products or the substances released as a result of their decay). 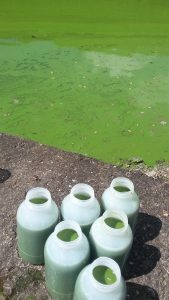 These substances are called AOM - Algal Organic Matter. AOM comprises mainly polysaccharides and hetero-polysaccharides; nitrogen compounds in the form of amino acids, oligopeptides and proteins; organic acids with predominating glycolic acid; lipids and fatty acids; phenolic compounds; phosphorus containing organics (organic phosphates); and further volatile aldehydes and ketones. Toxins typical for cyanobacteria – cyanotoxins – constitute a special group. AOM causes, due to its character, a whole range of problems during the coagulation process. Not only is their removal efficiency very low, but they also cause the removal reduction of other impurities present in water. Some cases are known when an escalated growth of algal bloom resulted in a total collapse of water treatment technology and water supply cut. There are several mechanisms of how AOM inhibits coagulation. Let’s mention at least one of them that is a formation of surface ligand complexes with Al or Fe cations being used as coagulants. AOM binds coagulants into these soluble complexes causing that they are not able to participate in the coagulation process anymore. This results not only in a significant increase of coagulant demand but also causes an increase of residual content of AOM in treated water, sand filter clogging, reduced adsorption efficiency onto granular activated carbon etc. The solution of this state is usually a radical change of the reaction conditions, i.e. decreasing pH to the acid values (4.5-5.5) where the complex formation of AOM and metals is minimal. If the pH value cannot be decreased for some reason (e.g. operational), the coagulation inhibition can be eliminated by the AOM pre-oxidation using e.g. potassium permanganate. Nevertheless, it has to be emphasized that the change of reaction conditions need not necessarily lead to the complete removal of all problematic AOM. AOM causes an adsorption inhibition of micropollutants onto activated carbon (AC). AOM can make the adsorption of low-molecular natural and anthropogenic substances, which cannot be removed by coagulation, difficult or even impossible. For instance, a reduction in pesticide removal efficiency, when a competitive adsorption between AOM and pesticides takes place, can be a serious problem. There are direct and indirect ways of competitive adsorption. In the case of indirect competition, AOM covers the activated carbon surface with its molecular chains and prevents pesticides from penetration into the inner structure of activated carbon and adsorption. During the direct competition, AOM competes with pesticides for the binding sites on the surface and in the inner structure of AC. The result of adsorption inhibition is an undesirable increase of micropollutant concentrations in the treated water. The solution of this problem is not facile and the only possibility is often the most efficient AOM removal during suitably set coagulation. This minimizes the AOM concentration in water and the probability of direct or indirect competitive adsorption will decrease significantly. The algal and cyanobacterial products negatively influence the organoleptic properties of water. Sometimes a fishy smell or earthy taste of water can surprise us unpleasantly. The substances causing these negative receptive properties of water are called taste & odour compounds and comprise e.g. geosmin, dimethyl trisulfide, 2-methylisoborneol, β­cyclocitral and others. These are mostly low-molecular compounds that are not removed on conventional water treatment (coagulation). Although these substances are not harmful to health, nobody wants to use such water in his bathroom or even drink it. An efficient method for removal of taste & odour compounds is the aforementioned adsorption onto activated carbon. A suitably selected type of activated carbon and optimized adsorption conditions can lead to very high removal efficiencies of these substances and eliminate the worsened organoleptic properties of water. A special group of AOM contains toxins that are characteristic primarily for cyanobacteria, i.e. cyanotoxins (e.g. well-known microcystins or nodularins). Their toxicity is relatively significant. For instance, microcystins (toxins of the Microcystis species) are 10 times more toxic than curare (toxin of the liana Chondrodendron tomentosum) and 40 times more toxic than strychnine (toxin from the tree Strychnos nux-vomica). However, it has to be emphasized that (from the drinking water consumer viewpoint) the tetanus toxin (toxin produced by a bacterium Clostridium tetani) is 100 000 times more toxic than the most dangerous cyanotoxins. Nevertheless, it does not mean that cyanotoxins cannot cause serious health problems such as various dermatitides, diarrhoeal diseases, stomach or respiration problems and in isolated cases even death. The best-known is probably the case from the Brazilian Caruaru where 131 patients of hemodialysis clinic were contaminated during dialysis with the saline solution containing toxins microcystin-ZR, -LR, -AR (cyclic hepta-peptides) and cylindrospermopsin (hepatotoxic alkaloid) originating from contaminated water. As a result, 52 patients died. The removal efficiency of cyanotoxins by the conventional water treatment (coagulation) is very low and therefore the adsorption onto activated carbon is used almost exclusively. Apart from the fact that some cyanobacterial products are toxic, AOM, or especially their polysaccharide and peptide/protein components, can form disinfection by-products (DBPs) as a result of disinfection performed after water treatment and before (or during) distribution of water to a consumer. Disinfection agents such as chlorine, ozone, chlorine dioxide or chloramines can form halogenated organic compounds, mostly trihalomethanes – THMs (chloroform, dibromochloromethane, bromodichloromethane) and halogen derivatives of acetic acid – HAAs (dichloroacetic acid, trichloroacetic acid, fluoroacetic acid) with AOM. More than 700 such compounds some of them being toxic or carcinogenic present in drinking water in concentrations of the order of µg/L have been detected so far. The formation of these secondary contaminants may be successfully prevented by the maximally efficient AOM removal on coagulation. If this technological step (coagulation) is low-efficient, it is needed to add another technological process of water treatment; most often it is an adsorption or membrane filtration and after that disinfection can be applied. Since cyanobacteria and the substances they produce influence the water treatment substantially and it is difficult to ensure sufficient water quality in periods of their increased occurrence, the attention of water treatment researchers is paid to this problem currently. The Institute of Hydrodynamics of the Czech Academy of Sciences has also significantly participated in this research in recent years. The research at the Institute is aimed at the evaluation of interaction mechanisms of AOM with coagulants and other impurities present in water. The toxicity and elimination of DBPs (formed during disinfection by the action of disinfection agents on the residual AOM) are also investigated. Further, the use of adsorption onto activated carbon is employed, especially for the removal of low-molecular components of AOM and their competition with micropollutants (pesticides and their metabolites) is evaluated. The research has also practical outputs that have been realized at the water treatment plants in Kutná Hora, Světlá nad Sázavou, Jince and others. Barešová, M., Pivokonský, M., Novotná, K., Načeradská, J., Brányik, T., (2017). An application of cellular organic matter to coagulation of cyanobacterial cells (Merismopedia tenuissima). Water Research. 122, 70-77. Čermáková, L., Kopecká, I., Pivokonský, M., Pivokonská, L., Janda, V., (2017). Removal of cyanobacterial amino acids in water treatment by activated carbon adsorption. Separation And Purification Technology. 173(1), 330-338. Načeradská, J., Pivokonský, M., Pivokonská, L., Barešová, M., Henderson, R. K., Zamyadi, A., Janda, V., (2017). The impact of pre-oxidation with potassium permanganate on cyanobacterial organic matter removal by coagulation. Water Research. 114, 42-49. Pivokonský, M., Načeradská, J., Kopecká, I., Barešová, M., Jefferson, B., Li, X., Henderson, R. K., (2016). The impact of algogenic organic matter on water treatment plant operation and water quality: a review. Critical Reviews In Environmental Science And Technology. 46(4), 291-335.